Over 69,000 Visitors from 1999 to 9/27/03! Note: The above two images (but not the first) are courtesy of Fantastic Fantails. Story of how my goldfish and catfish "got along"
View comments, photos, and stories relevant to this page. Note: See the links on the fishy source page for other places to visit on goldfish. Many of these people have more experience than I. In particular, the one goldfish link goes into great depth about plants to use with goldfish and sexing goldfish (Note: This site may no longer exist, please e- mail me if you know what happened to it). On my koi page: Telling Goldfish and Koi Apart and Interbreeding. 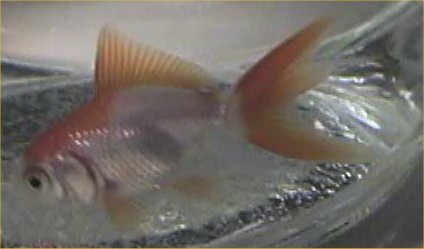 Kathy sent 22 photos of her fantail goldfish to me which I put on her own page. Someone also sent me four photos of their red capped oranda next to a bunch of eggs that she laid that I put on Twerp's Page. A tiny red and white fantail on 11/5/04. See the Glimmering Goldfish Web Ring at the bottom of my main fishy page. This site used to have a counter. The total number of visitors from 9/25/00 until 9/27/03 was 59100. The counter at the bottom of all the pages is for all the pages. The server reset the counter on 9/25/00. The last recorded hits was 10002 on 9/1/00 since March 31, 1999.